Though often associated with older generations, Bridge is gaining a following on the Trine University campus. The university's Bridge Club, competing as the Thunder Aces, took part in the 2019 College Bridge Online Club Special Team Tournament, sponsored by the American Contract Bridge League (ACBL). 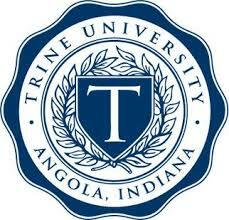 The competition included 31 colleges and universities, with Trine winning five out of eight matches - defeating two teams from the University of Chicago and teams from Alabama, Vanderbilt and Cal Tech - and tying for 19th overall. Retired chemistry professor Chet Pinkham, who supervises the club, said six of the club's seven members had never played before joining. Pinkham and Ken Bisson, a retired physician who is an ACBL-certified instructor, teach club members the game and its strategy. Pinkham recruits members by pointing out the game's similarity to Euchre, though club members said that, other than that both games involve taking tricks, there is a big difference between the two. Trine's Bridge Club will compete in upcoming ACBL collegiate events on April 7 and 14.